I had read that you could order this poster in XXL size, but when it was delivered to our home it turned out to be so immensely huge that it only fitted above our bed. When I get into bed at night it is the last thing I see before I turn off the light. And that is quite useful as this is the time I tend to start brooding. The text is placed against a background of merry paint splashes in all colours of the rainbow, like the first projects by preschoolers on big pieces of paper. An exuberant freedom from care splashes out towards us. A freedom which we irrevocably lose when we grow up. In Matthew 6:25-34 Jesus encourages us to be carefree. But is this not a bit naïve? As grownups we cannot but be aware of all the dangers surrounding us. And isn’t this a good thing? After all, small children can only lead a carefree life as long as we take care of them. Jesus definitely knows about the precariousness of our existence. Flowers and birds do not need trust, simply because they are not aware of their own impermanence and vulnerability. But we are. How easily we are overcome by worry. ‘Food, drink, clothing, surely, your heavenly Father knows that you need all this,’ says Jesus. But when worries about these things take over and become an obsession to you, you become short-sighted and narrow-minded. Then you start circling around yourself. ‘For where your treasure is, there your heart will be also,’ Jesus says. Then that is what your life has become. But life is more! It is God’s intention that we get round to more than just the material. There is something strange about money. I don’t know if you recognize this, but money always needs more money. Thinking of money hardly ever results in a carefree mood. In contrast, Jesus tells us that trust in God and the search for his kingdom put our worries into perspective. ‘But strive first for the kingdom of God and his righteousness, and all these things will be given to you as well.’ God’s kingdom is a land where there is freedom from worry and room for others. A few days ago the Feast of Tabernacles started for the Jews. This feast is a foretaste of that kingdom of God. And thus it is an exercise in freedom from worry. For a whole week they camp in huts made of branches, with roofs that are open to the sky. They enjoy the good life, the yield of the harvest, and laugh and drink in the company of family and friends. One can only really enjoy this, when one does not worry in advance about the cold and dark days that are approaching. ‘Do not worry about tomorrow, for tomorrow will bring worries of its own,’ Jesus advises, ‘today’s trouble is enough for today.’ Try to live day by day. That is what humans are made for. We cannot reach beyond that, though we often think we can. And try to live today as you would in the kingdom of God. Be open to the people around you. Dark clouds can cast substantial shadows, but these will always remain marked by the light that gives colour and space to our existence, like carefree splashes of paint. 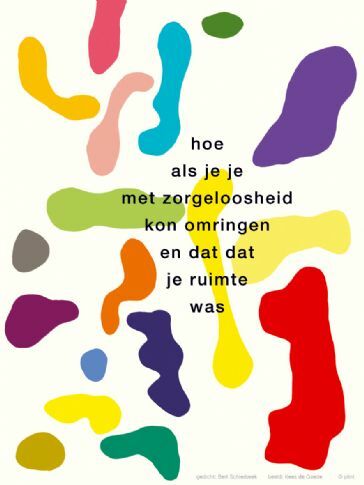 Bert Schierbeek (1918-1996) was a Dutch writer involved in the Dutch literary movement of the Vijftigers.